Do YOU know how to save a life? 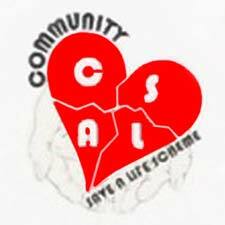 That's the question asked by a local organisation - CSALS - as they, in partnership with Bolsover District Council, launched a world record attempt for 'The World's Biggest First Aid Lesson' on Friday 5th Feb. 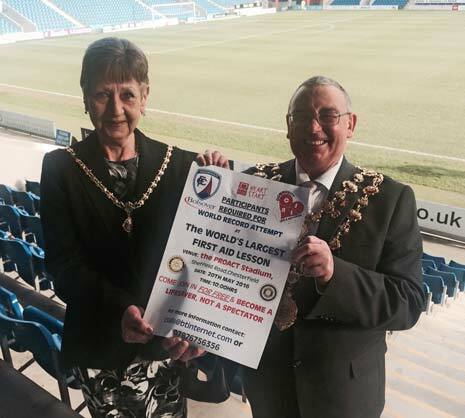 The record is currently held by Emirates Airlines, with 1,600 in attendance, but the effort on May 20th at the Proact Stadium at 10am, hopes to attract over 3,000 participants of all ages - every one of whom will leave with vital life saving skills. Dignitaries (above), including The Mayor and Mayoress of Chesterfield and all three local MP's - Toby Perkins, Natascha Engel and Dennis Skinner - heard Cheryle Berry from CSALS talk of how the not-for-profit organisation aspired to have "a lifesaver on every street" and regularly give free first aid sessions for anyone in order to achieve that. 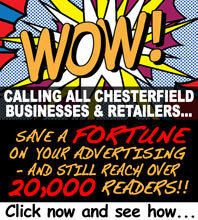 After the launch, Cheryle spoke with The Chesterfield Post and told us just how vital these skills were, "Our group was set up about five years ago and is about saving lives by teaching first aid skills. Over the last five years we have taught 27,000 people - all for free - and this event today is to raise the profile of the importance of life saving skills. "We are approaching schools and groups to take part. Everyone will leave being a lifesaver and there can't be anything more precious than that! "Here today are two men whose lives were saved and they are the first to say thank you to those who did it on their day. "Anyone can turn up on the day - be ready to start at 10am, you will be on the pitch. If anyone would like to have sessions we have a website or contact us by telephone - we will go where you want us to be! "We are very proud of the support we've had from Bolsover District Council, The Rotary Club and Inner Wheel, British Heart Foundation and other organisations like East Midlands Ambulance Service and CRY (Cardiac Risk in the Young), If we work together we can have a life saver on every street. The more we pull together we can do this!" One person at the launch owes his life to the skills of other ordinary people around him and is backing the event all the way. 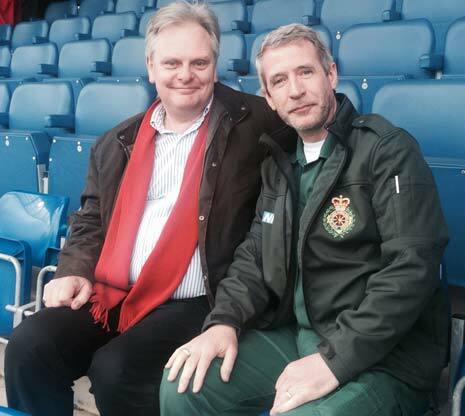 Melvin Kenyon is an Oldham fan who collapsed at the Proact when the Latics took on Chesterfield in November 2015. Several fans present, including an off duty paramedic (below right), performed CPR on the 58 year old, until medical help arrived. Having made a near full recovery, Melvin (above left) cannot praise those who helped on the day highly enough and was keen to encourage others to take up those skills too, "I am very proud to be at the launch and very grateful to the skills of people who were able to bring me round when I collapsed. I have no memory of it at all - it is good to be here today to try and get memories back but I have no recollection of it at all! It was a traumatic event and it's not surprising to have no memory of it. "These kinds of events can happen to anyone at any time and the more people that know about life saving skills - for example during this world record attempt - the better it's going to be. One life saved is one life saved. "I'm feeling a lot better - I'm hoping that Oldham will stay up and that I can come here to the Proact again with them next year! "The first people to give me CPR were Oldham supporters - one happened to be a trained paramedic - and they started work on me and as a result, I'm here today. I was in the right place at the right time, and so were they! "I would like to think that every football ground in the country had to have, as a legal requirement, a defibrillator and trained staff. It isn't, I believe, a legal requirement, and if it isn't - then it should be!" MP's Toby Perkins and Natascha Engel pledged their support for the attempt too with Natascha (MP for NE Derbyshire) saying, "It's something they have been working on for a very long time and this is just the planning stage and it's going to be massive success. This is being organised by volunteers and it's gong to put the area on the map. "It's also a ripple in the water and this is about teaching life saving skills. People can go and pass those skills onto their families - they have the confidence then to pass their skills on and that's critical. "Community initiatives like this are brilliant - these people are the heart and soul of communities. They're the real glue that holds communities together! "Anyone who already has life saving skills please come along and help teach others on the day! Let's break that world record!" Toby Perkins (MP for Chesterfield) added, "It's crucial - it will be real asset to the community if we have 3,000 more lifesavers. Someone nearly died here at the football ground recently and he survived because there was a lifesaver here at the ground. You never know the circumstances where it may be needed, and to know that you have the skills and you can save a life is important. "We have a Bill going through Parliament to try and have life saving skills brought onto the school curriculum." Anyone interested in attending the event itself on May 20th - or in organising a session at a group, can contact CSALS on csals@btinternet.com or call 07876 756 356.